Of all the gin joints. Humphrey Bogart became a mega-star following his iconic portrayal of the cynical, drunken anti-hero Rick Blaine in Casablanca — a story of romance and the perils of neutrality in the face of Fascism. S. – It is always a treat to watch Casablanca again, it has been a firm favourite of mine for a long time. You get Humphrey Bogart at his absolute cynical best, the luminous Bergman and an obscenely talented supporting cast in a tale that manages to weave humour, action and romance into what is a grim state of affairs. The humour is what struck me most about this film, it is effectively used to draw the viewer into what is a very complex and unusual environment. Suddenly the character with the unusual accent seems like a guy you can relate to after he has made you grin. There are so many witty exchanges (frequently with a delivery that is superbly dry), but it is the black humour of people who know they are trapped. The jumble of refugees clawing for visas out of this way-station is coated with a veneer of a languid sophistication as groups gather to plot, exchange gossip and gamble at Rick’s Café Américain each evening. It is evident that Rick operates on a different level to everyone else, comfortable to profit from the sea of desperation surrounding him but showing no ambition to escape himself. All very mysterious, until a certain someone walks into his gin joint and the pieces begin to fall into place. J. – Or is it that they fall out of place? Casablanca is a long-standing favorite of mine, a movie that I can watch any old time and be sure to enjoy myself. By all respects it really shouldn’t work as a movie, and given that it was essentially created by committee, it is a marvel it all holds together as brilliantly as it does. You mentioned that it manages to weave humor, action, and romance together, but what amazes me is that it manages to be all those movies at the same time. That is, I wouldn’t really call Casablanca a romantic drama with elements of comedy or a comedy with elements of romantic drama — it is fully both at the same time, while also being a political thriller and an action adventure. One of the things that I struggle with when it comes to Bollywood cinema is that Indian films tend to try to be everything, cramming way too much into a single movie — and then making it a musical too. But Casablanca does the same thing — indeed it also has three or four scenes driven by musical numbers — and yet it manages to work so excellently together. And I agree that this is particularly true of the humor, which runs the gamut from sarcastic and provoking to downright silly, but always serves the characters and the mood of the film. And the dialogue is sparkling throughout. Ingrid Bergman gets a few lines that are perhaps a bit on the insipid side, but in general every character is served excellently by the script. This is particularly true of Bogart’s Rick and Claude Rains’ Captain Renault. Any discussion involving either character is pretty much guaranteed to be great, but I think the film is at its best when Bogart and Rains are acting against each other. Their talks are just swimming with subtext and the unsaid, but both characters get each other so completely that the audience is somehow transported right into the politics and inside jokes of the situation without ever being preached at or condescended to. For all its fame, Casablanca contains few really memorable images, instead living on through its excellent script and performances. But the wordless introduction to Humphrey Bogart’s character ranks as among the best in film. 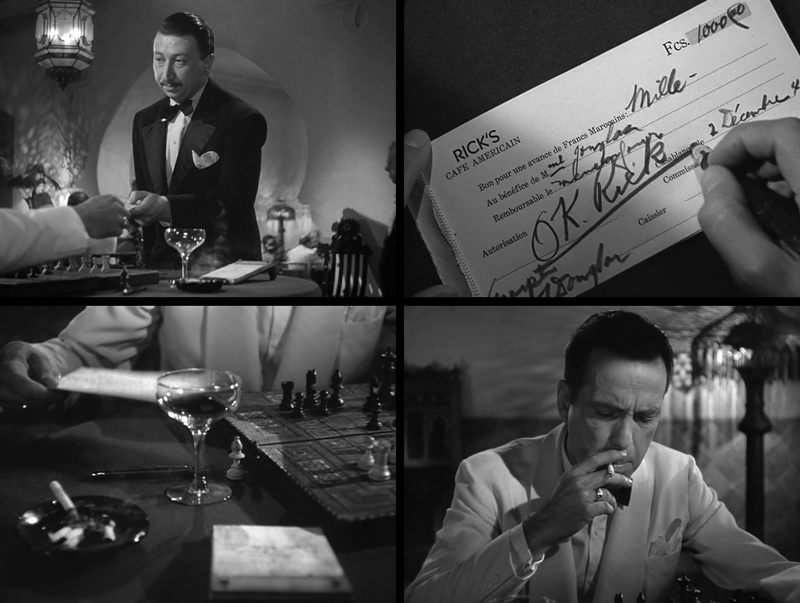 A man hands a slip to an unseen gentleman; the unseen man signs the paper with bold, forceful stroke; a cut is made to the cigarettes and booze upon the table; and then the slowly pans up to show Rick absorbed in a solo game of chess. Everything you need to know about the character is right there without a word spoken. S. – The relationship between Rick and Captain Renault is the backbone of the film and possibly what makes it more enduring than if it were just a classic romance. Renault does double-duty acting as a the prime example of the casual corruption of life in the border lands and also provides a running commentary to paint a picture of the Casablanca version of the mysterious loner Rick. I would argue that you can add buddy-flick to the genres we have already listed. They have a rapport born out of them both being willing to take advantage of what they acknowledge to be a despicable situation and in true Hollywood style the banter flows freely. While we eventually learn the source of Rick’s cynical view of the world, the background of Captain Renault is never made clear. This is possibly for the best given that his main vice seems to involve taking advantage of vulnerable and desperate young women. Both of these flawed men do get a shot at redemption, which is the true payoff of the film rather than the guy getting the girl. Claude Rains is marvelous as Captain Renault, getting the majority of the film’s best lines and generally walking a fine line between being charming, ruthless, and downright sleazy. Renault is by all rights a terrible person, but strangely impossible to dislike. It is a confident performance, perhaps the finest in a film full of great performances. J. – But those desperate young women lead me to one of the most excellent things about Casablanca: the cast. Renault uses his position to take advantage of refugees looking for an exit visa to head to Lisbon and on to America, and as it happens, the vast majority of the cast are European actors who have fled the Nazis. This adds a tremendous verisimilitude to the film, by having many of the players be very obviously not American (compared, for example, to the use of exceedingly not Hungarian actors in the Budapest-bound The Shop Around the Corner). It also means that top rate European actors that would have been stars in their respective countries can be utilized here for bit parts. Take French star Marcel Dalio, who has already appeared in leading roles in two Sight & Sound list movies. In Casablanca he plays the small part of a croupier in Rick’s illegal casino — a pittance of a role with a megawatt talent being deployed. And that cuts across most of the cast, with particular props going to one-time German star Peter Lorre. Lorre’s small role in the film is over with within the first 15 minutes, but it is beyond essential. Lorre’s character Ugarte introduces the principle MacGuffin of the film, and it makes no sense whatsoever. Ugarte supposedly has come across papers of transit signed by General Charles de Gaulle that cannot be questioned and must allow the bearer to pass. OK, sounds good, except that de Gaulle was the head of the Free French and would have no authority in a Casablanca controlled by the Nazi-puppet government of Vichy. But Lorre’s twitchy, sleazy performance sells the papers 110% and sets things in motion with gusto. And, of course, two thirds of our main love triangle are also European actors, with Ingrid Bergman as Ilsa Lund and Paul Henreid as Victor Laszlo. 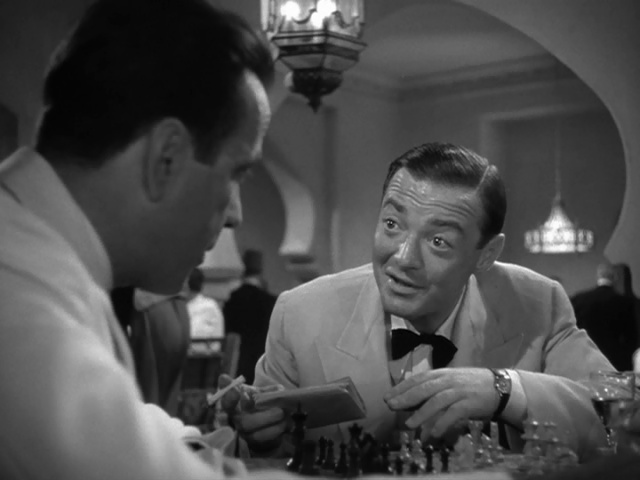 Peter Lorre only has a couple of minutes of screen time but he makes every second count, putting in a twitchy, nervous performance that is key to selling the audience on the importance of the transit papers that set the whole plot in motion. It’s a shame to see him to depart so quickly, but a little Lorre is always a welcome thing. S. – The talent placed in bit parts verges on the obscene. What outrageous extravagance to kill Peter Lorre in the first 15 minutes! Now with the advantage of over 40 Sight & Sound films under my belt, the screen is littered with familiar faces performing menial tasks, such as tending bar and dealing out roulette chips. It does lend authenticity to the aura of displacement and getting that foundation right provides the ballast essential to the film. You mentioned Casablanca was the product of a committee, which usually spells doom for a creative enterprise, but I believe the vitality injected by such a depth of talent elevates this movie: Bergman is entirely believable as a woman torn between duty and desire, while Henreid brings the gravity and charisma required of a rebel leader. The troubled multinational crowd bring a jumble of baggage to Rick’s cafe and the place practically hums with resentment toward the relaxing Nazi personnel. A tinderbox of personalities are presented in an exotic location with a MacGuffin launched by Lorre, the result is spectacular. 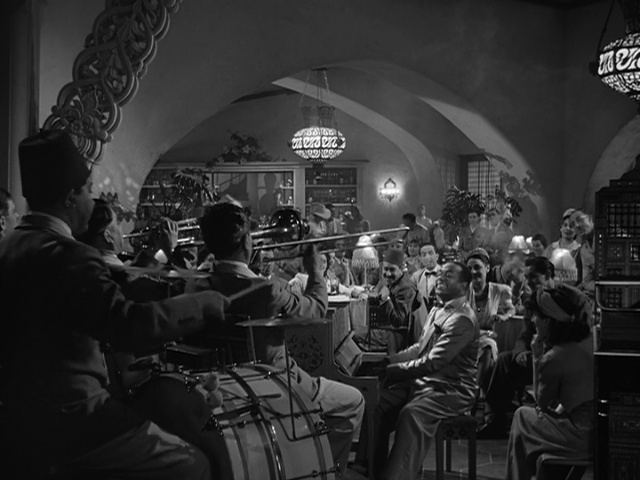 Though not a visual feast, Casablanca is a film with a lot of atmosphere, in a film noir sort of way, as the shadow-filled confines of Rick’s café show. And we must apologize for not mentioning Dooley Wilson as piano player Sam, who does a fantastic job with a role that does feature some cringe-worthy elements of racial stereotyping. J. – One of the things that I find rather interesting about Casablanca is that it manages to be so excellent without really having a visionary force behind the camera. The acting and the script are so good that one doesn’t bother to notice how few killer shots or compositions are in the movie. Director Michael Curtiz is by no means a bad director, but he’s not someone who has a distinctive style or any particular interest in creating compositions that are memorable on their own terms. To date, the Sight & Sound films I have been most drawn to are those with inventive and beautiful visuals, but Casablanca succeeds perhaps because of its lack of visual bravado as it draws that much more attention to the performances. Curtiz and cinematographer Arthur Edeson do make excellent use of shadows and fog, but it is more to establish a mood than to create gorgeous compositions. A perfect example is the spotlight atop the airport tower, which for inexplicable reasons shines on the ground and right across the front of Rick’s club. That doesn’t make any sense at all, but it sets the mood of a city that is akin to a prison camp and presents a constant reminder of the hope of getting on that next plane. But all that said, it was tough to get good screen grabs for this entry and so, like the film, I selected shots that distilled characters and plotting rather than just stuff that looked cool. S. – I appreciate that the director nailed all of the technical aspects but really just got out of the way of the performers. It is very much a character-driven piece and the cracking pace adds to the sense of urgency felt by everyone held in limbo. I thought that music was used to great effect in adding a sense of community to the collection of displaced individuals, never more so than when Victor Laszlo leads the rousing rendition of “La Marseillaise” (which as you yammered previously, J., is strongly reminiscent of a scene in La Grande Illusion). But even the less fraught musical moments, such as “Knock on Wood”, give the viewer the sensation of escape from the ever present struggles faced by the patrons of Rick’s café. And of course there is the recurrent snippets of “As Time Goes By” that so vividly haunt the star-crossed lovers. The way music is incorporated really amps up the emotion of the scenes without allowing them to become overly sentimental, for when the music stops the actions leaps forward once again. Paul Henreid gives a low-key but sincere performance as freedom fighter Victor Laszlo. A lot of people find him to be an unsympathetic stick-in-the-mud, but it’s hard to reconcile that portrait with his commanding role in the “La Marseillaise” scene. J. 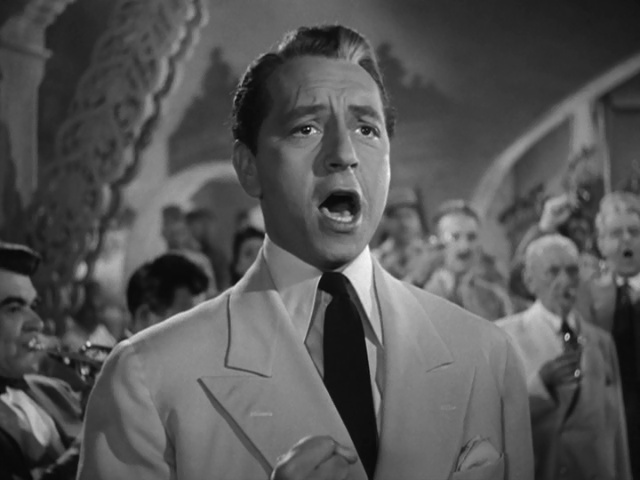 – I would say the “La Marseillaise” scene isn’t reminiscent so much as stolen from La Grande Illusion, but I think it actually plays better in Casablanca than it did in the original. 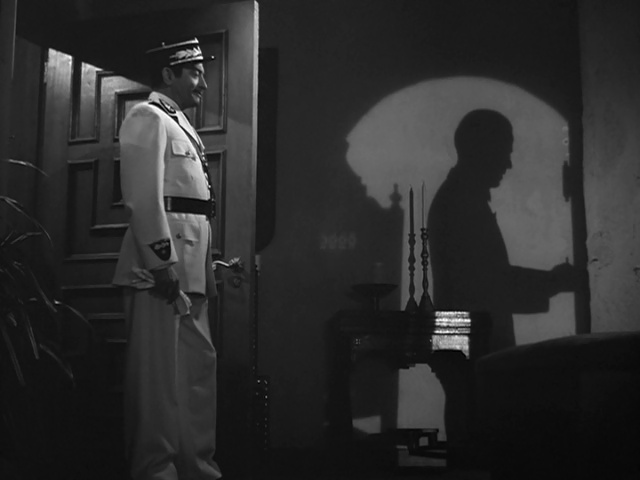 Jean Renoir’s single take scene is a masterful bit of direction that is far more technically proficient than what Curtiz does here, but the moment is much more character-driven in Casablanca. From the boldness of Laszlo to the silent assent of the usually neutral Rick, it just plays more powerfully and literally sends a chill down my spine each time I see it. No doubt the impact is also that much greater because the French anthem here is being used as a rebuke to the Nazis, who have found a niche as perhaps cinema’s most reliable villains, and also because many of the performers in that scene were actual exiles who fled the blitzkrieg. And that scene I think is the perfect illustration of a big problem I have, not with the movie, but with far too many viewers’ interpretation of Paul Henreid’s performance. Everyone always wants Ilsa to end up with Rick, and Henreid’s Laszlo seems to be thought of as an unlikable stiff. I’ve never really seen it that way. I can understand the surly charm of Bogart’s character, but there is a definite dignity and overt courage to Laszlo that I can absolutely see as being powerfully appealing to Ilsa. 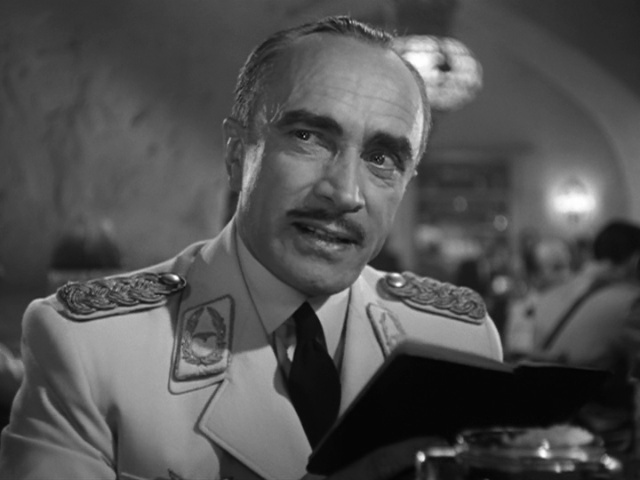 Henreid might not get the best lines and he certainly doesn’t give a showy performance, but he does convey an authority and a sense of empathy that nobody else in the crooked world of Casablanca can provide. I actually think it’s a terribly difficult and thankless role, and Henreid does an excellent job in it, particularly as the driver of the “Marseillaise” sequence. But I suppose this brings us to that great romance we have heretofore largely ignored: Rick and Ilsa, whataya think, S.? 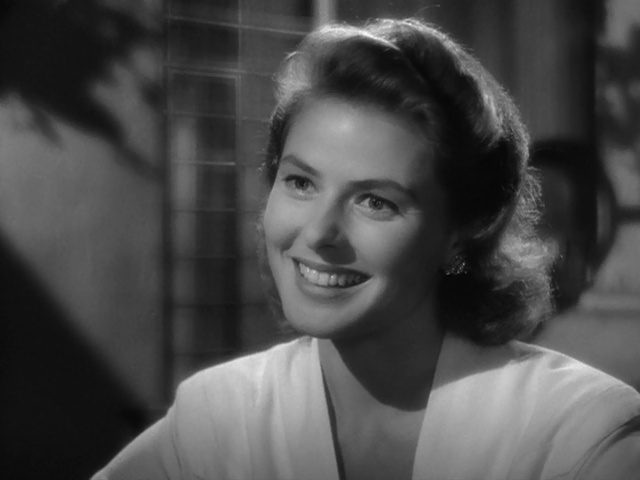 Casablanca probably shows Ingrid Bergman at her most lovely. Certainly the film goes out of its way to give her an almost dreamlike appearance, carefully lighting her face and applying a soft filter to the lens for many shots. But more importantly, she gives a very strong performance as a woman convincingly torn between two very different men. I think this is pretty much the entire movie in a single shot. Angry Rick, suspicious Laszlo, conflicted Ilsa, and Renault stirring things up in the middle. This initial meeting between the principals is a killer scene, and the film really takes off from this moment. J. – I agree that the triangle is handled supremely well. The performances by Bogart and Bergman, in particular, are very affecting, with a great deal of chemistry between the two leads. And I think the film benefits greatly from having obstacles between the two former lovers that are greater than the “problems of three people [that] don’t mean a hill of beans”, because it adds extra gravitas to the sacrifices made and enables excellent characters like Renault and Conrad Veidt’s Nazi commander to serve as extra monkey wrenches in an already complicated situation. That makes for a much more compelling dynamic than if it was solely Bogart v. Henreid. I like the comparison to Partie de Campagne. I don’t think Casablanca has anywhere near the emotional heft of that movie, but like the plight of the lovers in Renoir’s film, the obstacles separating Rick and Ilsa are also legitimately huge and unresolvable, and not petty contrivances. But as full of praise as we have been for Casablanca, it is not without its flaws. One aspect that has annoyed me for years is the film’s apparent fetish for the word “Casablanca”. It is said over and over and over again instead of a more sensible “here” or “this place” — one of the few blemishes on a mostly crystalline script. Since I’ve seen the film well over a dozen times, I took the liberty this time of counting how many times the word “Casablanca” is uttered in the film: 48 — that is ridiculous. The only other thing that rubs me the wrong way is a small, but crucial, part played by Joy Page. Page got the part of a Bulgarian newlywed being preyed upon by Renault because she was the step-daughter of studio head Jack Warner. It’s not so much her performance that I mind but rather that she just doesn’t fit in with the rest of the ensemble. In Casablanca, the European refugees tend to be played by actual European refugees, so having an all-American girl suddenly pop up as a “Bulgarian” is extremely jarring, and pulls me right out of the film. Thankfully, it is a short scene. We didn’t really get a chance to talk about how excellent Conrad Veidt is as Major Strasser, the main villain. Veidt was a star of German cinema (and starred as the killer somnambulist in the influential horror classic The Cabinet of Dr. Caligari). Married to a Jewish woman, he was a staunch opponent of the Nazis. After fleeing to America, the actor demanded that he play villain roles in an effort to drum up anti-Nazi sentiment through his performances. His Major Strasser is a wonderful combination of cool menace and angry impotence. S. – I adore this film for being wonderful entertainment and it is going to comfortably slot into my Top 10… So Far (the first one to crack into that group for a while). But it is not going to take the top spot and that is because, for all of it’s many attributes, it didn’t really challenge me. Part of what I love about Casablanca is that it champions personal integrity, an idea that conforms very closely to my ideals, so it is quite easy for me to love this film. But for a movie to really get under my skin it needs to open up a door I haven’t walked through before. Nevertheless Rick’s Café Américain is a place I am sure to visit again and again. J. – I also passionately love this movie, and it is comfortably among my favorite (and most watched) films. But I think you are right on the money, S., when you say that it isn’t a film that challenges the viewer. I feel like Casablanca and Steven Spielberg’s Raiders of the Lost Ark are the absolute pinnacle when it comes to entertainment cinema — that is, movies that enthrall and excite without necessarily making you think. And that’s in no way a knock against them. 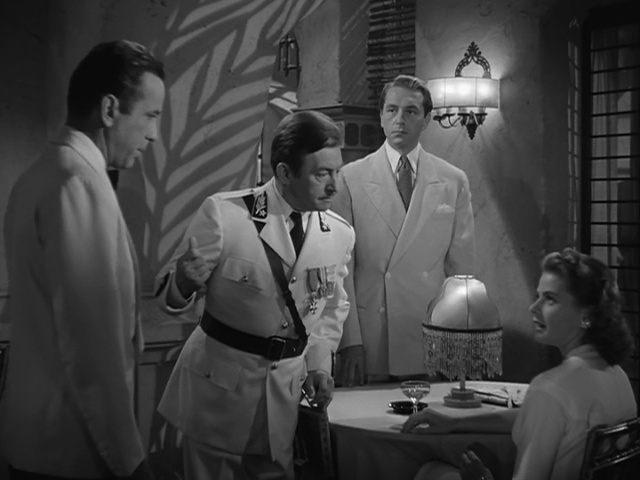 There has always been a populist element to movies, and Casablanca should be recognized as the film that brings out the absolute best of that facet of cinema. I know there are going to be numerous films in the Sight & Sound list that will engage and astound me more than Casablanca, but I can guess which movie will get more showings on our TV, maybe not today, maybe not tomorrow, but soon and for the rest of our lives. “Casablanca” is my all-time favorite movie. I have the movie, but I also watch it every time Turner Classic Movies airs it, and I never tire of watching it!